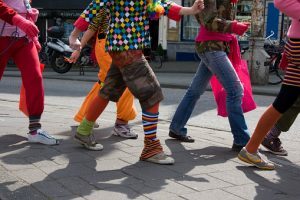 Halloween pedestrian accidents are very common, with double the number of pedestrians dying in auto accidents on Halloween night as compared with on other days of the year, according to Safe Kids Oregon. There are many different reasons why there are more pedestrian accidents on Halloween. Motorists need to understand the kinds of dangerous behaviors which cause pedestrian and car crashes, as well as the conditions which lead to an increase in Halloween pedestrian fatalities. One common cause of Halloween pedestrian accidents is an increase in alcohol use before driving on Halloween night. According to Mix, 44 percent of the deadly accidents on Halloween involve a driver who has a BAC above the limit, and 23 percent of pedestrian deaths on Halloween occur in accidents with a driver who is intoxicated. Just last year, Oregon Live reported on one such DUI accident which led to a tragic fatality. The incident occurred in North Portland. A driver who had consumed approximately three to four beers at a party got into a fight with his girlfriend and left the celebration. He saw a pedestrian who was halfway across the road as he was driving on North Lombard Street, and he tried to swerve to the right to avoid hitting the pedestrian but was not able to do so. He ended up striking the pedestrian, who slammed into the vehicle by the driver’s side window. The driver tried to help the pedestrian, who had been spending time with friends and celebrating his 27th birthday which fell on Halloween. The pedestrian decided to leave and walk to the store but was struck by the car when he was on his way. Unfortunately, the driver could not help the pedestrian, and the pedestrian died of his injuries. Friends did not discover what happened until the next day, as they thought he had simply run into other people on his way to the store and not returned. Approximately two hours after the collision, the driver’s blood-alcohol concentration (BAC) was measured at .03, so police believe it was likely over the limit at the time of the incident. The driver also submitted an affidavit in which he rated himself a four on a scale of one to 10 when asked how comfortable he felt driving. Police believe he was going around 40 to 50 miles an hour on the road when he hit the pedestrian. Accidents like this one are far too common when people go to Halloween parties and then leave those parties too intoxicated to drive home safely. Drunken drivers, however, aren’t the only reason for elevated accident risks on Halloween. There are also more accidents simply because there are more cars on the road and more pedestrians out. Particularly after dark, there are many more children outside walking around then usual. If drivers aren’t prepared to watch for these kids, serious and sometimes fatal pedestrian accidents are the likely outcome. Oregon law requires you report accidents under certain circumstances. You may also wish to report accidents to your own insurance company or to the car insurance provider offering coverage to other drivers who were involved in the collision. It is important to understand how to report a car crash in Oregon so you remain in compliance with the law and so you maintain your right to receive benefits and compensation after a collision. There is damage to your vehicle exceeding $1,500. There is damage to any vehicle equaling $1,500 or greater and any vehicle must be towed away from the scene of the collision due to the accident. Injury results from the collision. Death results from the collision. Any person’s property, other than a vehicle involved in the collision, sustains $1,500 or more in damages. The accident occurred in an area open to the public for use of motor vehicles. 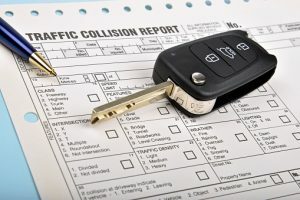 Accident reports have to be filed even if your vehicle was the only one in the crash. 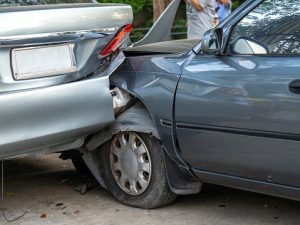 Drivers who agree not to file accident reports when $1,500 or more in damage is done are in violation of the law, even if the other driver agrees to pay for damages. Your accident report has to show the name of your liability insurance company. If any driver did not have insurance coverage at the time of the crash, the motorist’s driving privileges can be suspended for a year. This is true regardless of whether that driver was at fault. Insurance companies have to tell DMV about accidents in which any driver is uninsured. As of January 1, 2010, there is also a separate requirement mandating drivers notify law enforcement of accidents. The non-emergency number can be used to provide a required crash report, however 911 should be called in the event that injuries are serious. When 911 is called, no additional notification to law enforcement is necessary. If any driver is involved in a crash but is physically incapable of providing notice to a law enforcement agency, vehicle occupants are required to call the police when it is possible for them to do so. In addition to making legally-requried reports to the DMV and police, you should also report the collision to your insurer. Oregon requires the purchase of personal injury protection (PIP) so your insurance company will cover medical treatment expenditures for more minor injuries. Liability coverage is also required. 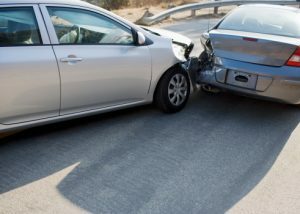 In the event of serious injuries or a wrongful death, crash victims can pursue a claim for compensation from a driver whose negligence or wrongdoing causes the collision. A claim can be settled outside of court or a jury or judge may decide liability and damages in a personal injury or wrongful death civil suit. Over the course of five years, there were 4,400 fatalities in construction zones. The majority of victims were in cars, rather than engaged in construction work. There were also 200,000 victims injured in accidents in construction zones. Many different types of motor vehicle accidents caused these workplace injuries. However, Federal Highway Administration reports the most common type of car accident that occurs in construction work zones is rear-end accidents. Rear-end collisions happen if a driver strikes the back of the lead vehicle. The rear driver is usually held responsible for crash losses, although there may be some exceptions to this rule. If the rear-end crash causes injuries or death, the motorist responsible for the accident must provide compensation for losses. The majority of people killed in accidents in construction work zones are working-aged individuals, which may mean a lifetime of lost income for victims or families of those who are no longer able to work in the wake of a serious collision. The financial and emotional impact of losing a healthy, productive person can be devastating on families. Drivers are the people most likely to die in car accidents in construction zones. Together, drivers and passengers in vehicles made up 85 percent of total victims killed in collisions in construction areas. Prevention of rear-end crashes could go a long way towards saving the lives of motorists and vehicle occupants involving in such construction zone accidents. Motorists must understand how long it takes to stop their vehicles. The majority of fatal accidents in construction areas occur on roads where the speed limit is faster than 50 miles per hour. At a 50 MPH speed, a vehicle on a dry road will take 300 feet to stop. Unfortunately, some drivers don’t leave enough room between vehicles to safely stop. Larger vehicles have more momentum and take longer to stop. An 80,000 pound truck will take 50 percent longer distance to stop. If the road is wet, the passenger car will take 400 feet to stop when going 50 MPH and the truck will take as much as 50 percent longer. Maintaining a safe following distance to allow enough time to stop is essential to avoiding crash risks. 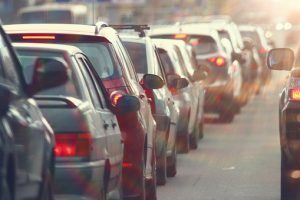 Many drivers become frustrated with construction zones, especially if there is traffic, and tailgate and do not leave enough space. A leading cause of rear-end crashes, including in construction zones, is distracted drivers. The Washington Post reports 87 percent of rear-end accidents happen due to driver distraction. Construction zones can be a major source of distraction as motorists do not focus on the car ahead but instead look at work being done on the road. When drivers take their eyes off the road to check construction, they may not notice and not react quickly enough if the vehicle stops in front of them. Drivers who look at a phone or GPS device to see if there is an alternate route to avoid construction might also take their eyes away from the road and increase the risk of causing a rear-end crash.